The North Face Ultra Fastpack Mid GTX, despite having a mid-height upper, was one of the lightest shoes in the test, and one of the best performers. The Ultra Fastpack Mid runs on the small side (I am true size 11 US and the 10.5 fit me perfectly) and feature a normal to narrow fit with good arch support. I was shocked at how much I liked these shoes. Maybe it’s my fashion sense and I just wasn’t crazy about the mid-top sneaker look. In retrospect, it’s one of the best things out there to prevent ankle rolling. Despite the higher ankle, the shoe weighed less than most others. But the lightweight simplicity did not equate to lower performance. There’s really nothing I didn’t like about the Ultra Fastpack, at least nothing that I didn’t overcome by field testing them thoroughly. The Ultra Fastpack Mid GTX beat most of other tested models in terms of stability, thanks at least in part to the mid-high ankle construction. But that performance also owed its success to the unassuming outsole and the perfectly appropriate width of the shoe. The shoe also features a “TPU Cradle” technology, which adds to the feeling of having your heel locked in for a confident gate. I felt very secure and protected in the Ultra Fastpack Mid GTX. Obviously you’re protected from getting wet through the shoe, which is very confidence inspiring during snow, wet/muddy conditions and stream crossings. Plus the Gore-Tex makes a little more sense with the higher mid cuff anyway. Despite its basic nature, the lower is completely rugged and durable, and the upper is well protected while still being made largely of supple materials. Of course, the Pebax bottom shank and “Snake Plate” bruise protector both ensure protection as well (without adding weight). Sometimes when I got back from my hikes I forgot I was even wearing a hiker and had the shoes on most of the day, feeling like I was just wearing a sneaker. The minimal weight and exception fit—on par with a trail runner—make the shoe supremely comfortable. Add in the fact that is looks so good, and is waterproof and I might end up utilizing The North Face Ultra Fastpack Mid GTX as an adventure travel shoe. 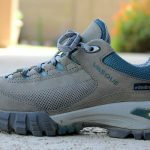 The Cradle technology used by The North Face does seem to promote a healthy stride, so long term, your feet are more comfortable over the course of your miles. The construction of the Ultra Fastpack will come as no surprise to those familiar with TNF trail shoes. It’s made to last, not forever, but to take a reasonable amount of abuse and wear and tear through peak bagging. It’s got an injection molded, dual-density EVA midsole like many of its counterparts; and a Vibram rubber outsole that cradles the shoe with a confidence-inspiring tread. Unique features like reflective webbing and a reinforced toe further ingrained in me that these were good shoes. Everything that I’ve explained so far all add up to a high-end performance picture for the Ultra Fastpack Mid. 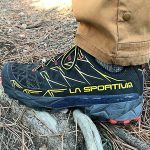 Despite its middle-of-the-road price, despite its unassuming design, its simple tread pattern, slightly dorky mid-height…this is a high performance light hiker engineered for covering ground and bagging peaks. 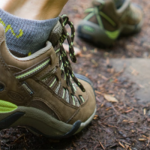 From Gore-Tex to Vibram to Pebax, it’s got the top branded ingredients to get the job done. The Cradle technology and rear TPU quarter weld further add to this performance picture.